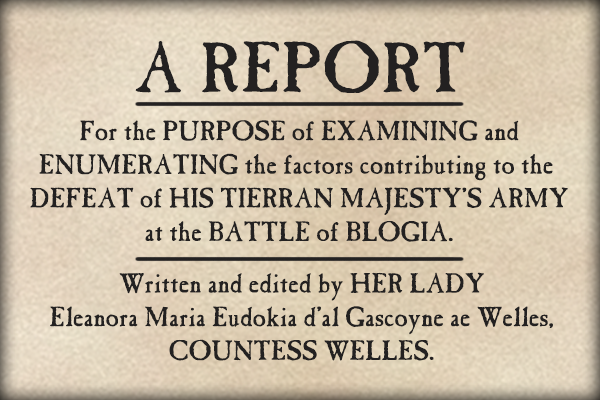 NOTE: Here it comes – my very first piece of patron-funded world-building, the introduction to the famous Welles Report, the after-action report on the climactic battle of Blogia which not only set in motion some rather drastic changes within the Tierran Army, but also catapulted Eleanora, Countess of Welles, to a position on King Miguel’s staff, where she appears in Guns of Infinity. This first section is only the introduction, and it is a bit short. Those parts that follow (to be posted over the next couple of months) will be considerably longer. Once the whole thing is up, I’ll be opening the floor to patron suggestions and voting. Note: The following is the version of the report that was made available to the general publick in late 609. An unexpurgated version was made available to certain officers of HM’s Government at the same time. The latter remains a protected document under the Secrets Act of 571. It has become the fashion, as of recent days, for those individuals who claim themselves well-versed in the affairs of war and other great affairs, to apportion blame for the recent defeat of HM’s Forces in Antar. While such efforts may prove to serve as some vent to the anger and shock felt after the disastrous news of the spring of 607, the privately composed reports thus far having been made available to the publick have served little purpose, save to feed the unfounded suspicions of those minds already susceptible to libel, paranoia, and defeatism. However, the desire to examine the causes for the disaster at Blogia, when supported by observed evidence and first-hand accounts, might also be turned to some constructive purpose, namely to the task of identifying and enumerating the major causes of the defeat, for the purpose of advising those with the ability to ensure that such issues be rectified. As of the current writing, it may very well be said that the publick’s direction of the blame for the loss at Blogia might be directed at two targets: the first of these being the Commander of our forces, the late Duke of Wulfram; the second being the abilities of his opponent, Prince Mikhail of Khorobirit. In their arguments for their preferred theories, the partisans of either argument have long since strayed into absurdity, either characterising the former as a senile imbecile, or praising the abilities of the latter until he appears in their description as a figure of martial divinity, Saint Stanislaus himself returned to the face of creation. While it is not the intention of this report to either defend the reputation of the late Wulfram, or diminish the threat likely to be posed by Prince Khorobirit in his current position as the League of Antar’s champion, it does intend to wholly prove false the assumption that it was some great ability or deficiency on the part of the opposed commanders which served as the sole determinant of the outcome of the battle. In the following pages, the argument shall be advocated that the defeat at Blogia was caused by serious institutional flaws within the organisation and equipment of the King’s Army, flaws which did not make themselves immediately fatal until confronted with a major enemy force led by a competent commander. In introducing, examining, and enumerating these flaws, it is hoped that they may be offered some form of correction, in a fashion drastic and timely enough to ensure that the great sorrow which the late defeat has inflicted upon us shall not be laid upon His Tierran Majesty’s dominions again.